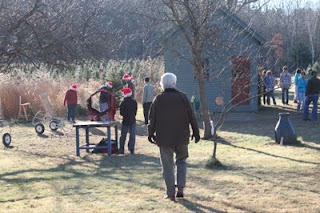 Aponovich and Johansson At Home and Away: A Trip to Walker's Green Trees.....Time to grab a saw and select a tree! A Trip to Walker's Green Trees.....Time to grab a saw and select a tree! Each year around this time we make a pilgrimage to select and cut our Christmas tree at Walker's Green Trees in Madbury, New Hampshire (USA). Ian & Melissa Walker are the warm and charming owners of this tree farm, where the most beautiful evergreen trees are grown. The tree caught our eyes immediately. This is it! This tree comes home with us. Here at Walker's the tree gets shaken. Chilly after being in the cold air cutting a tree? Find warmth, perhaps some mulled cider, ornaments and friendly faces inside the small out building covered in wreaths made here at the farm. This is a true family operation here at Walker's.It sets the tone that starts our holiday season! A few years ago we helped Ian & Melissa plant tree seedlings at the farm. Ian gave us 10 fraser fir saplings to bring home and plant in our field.This year,for the first time,we will have this tree grown in our field (pictured above) on our porch decorated with white lights and Swedish wheat ornaments. The 8' tree from Walker's will be in our living room . 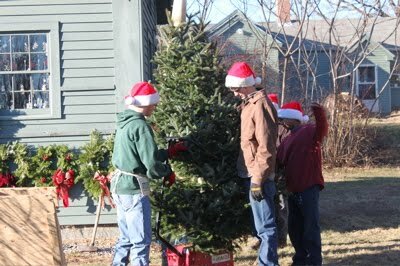 It will be decorated with hand blown glass ornaments made by local artisans. We have been collecting these ornaments for 30 years. You don't even need to bring a saw.....they will provide one! 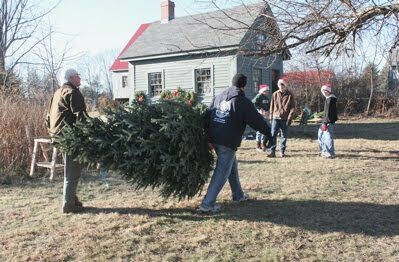 Do bring a pair of gloves , maybe boots (depending on weather) and head out to find the perfect Christmas tree. The walkers are a wonderful family. They have lovely trees to choose from. There will also be some visiting alpacas. Come by and enjoy the warmth. First time thwre this weekend...beautiful trees w great selection. 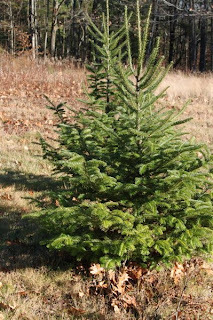 Brought home a Balsam Fir that is just gorgeous, of couse more special because my daughter and I picked it out and cut it down. $45 any tree. Thank You!!!! !